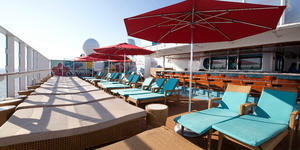 Cruise ship sun decks are much more than a simple place to swim and sunbathe. Modern top-of-the-ship activity centers can feature multiple pools and hot tubs, water parks with slides and splash zones, outdoor movie screens, active pursuits (ropes courses, ziplines, rock climbing walls and surf simulators) and serene, adults-only lounge spaces. And you're never far from a place to grab a drink or bite to eat. If outdoor relaxation and entertainment are priorities when choosing a cruise, check out our favorite cruise ship pool decks. Freedom-, Oasis- and Quantum-class ships make sure there's a swimming and sunning option for everyone. One pool is for swimming and another for sports (think water-jousting and pool volleyball) and, of course, whirlpools are at the ready for a hot-water soak. 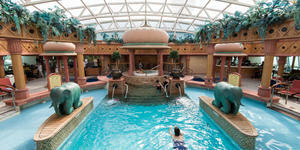 Oasis, Allure, Harmony and Symphony also have "zero entry" pools that are great for gradually wading into deeper water. The H2O Zone and Splashaway Bay are for kids only. The expansive areas are fitted with a kids' pool, water cannon and abstract, colorful sculpture fountains. Adults have their own play place in the kid-free Solarium, touting a pool, hammocks, swinging chairs and cantilevered whirlpools that hang over the side of the ship, providing incredible ocean views. 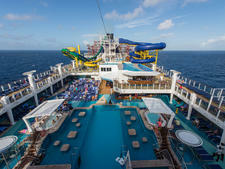 Royal Caribbean's signature pool attraction is the FlowRider, a surf simulator on which the most daring passengers can try their boogie-boarding and surfing skills. 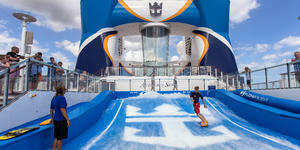 Freedom- and Quantum-class ships have one FlowRider each, while Oasis–class ships have two apiece. For armchair surfers, some ships have bleachers that provide up-close views of the thrills and spills of the surfing daredevils. For sun deck dining, the Solarium pool has a cafe that features pizza, while the self-serve Sprinkles provides frozen yogurt. If you're looking for a healthy drink option, Squeeze sells various fruit drinks. Sun decks on Norwegian Epic, Breakaway and Getaway begin with the typical pair of pools, surrounded by fountains and an ocean of loungers, but it doesn't end there. Little ones have their own place to frolic in the Splash and Play Zone, a shaded oasis of fountains, wading pools and animal sculptures. This kiddie area is tucked under the water slides of Epic's mammoth Aqua Park. The main attraction there is the Epic Plunge, in which tube-riders zip into a giant funnel before dropping through a 200-foot-long chute into a pool below. On Norwegian Breakaway and Getaway, passengers will also find ropes courses -- complete with planks that jut out over the sides of the ships -- next to the water slides, one deck up. On Norwegian Escape, passengers will find the largest ropes course at sea; Aqua Park, a giant water park; a two-story bar; and two huge LED screens. Norwegian Bliss features thrilling activities like laser tag and go-kart racing on its sun deck, in addition to a splash zone and a freefall water slide called Ocean Loops. For a quieter retreat, head to Spice H2O, a tiered, stage-like space that serves as a complimentary adults-only pool during the day, complete with the huge outdoor LED screen that's becoming a staple of cruise ship sun decks these days. Another peaceful spot is the nearly hidden, unfrequented sun deck aft on Deck 18. For more exclusive sunbathing, try the Vibe Beach Club (for-fee), where staff are on hand to bring sunbathers chilled towels, spritz them with Evian water on hot days and take/deliver drink orders. But the real VIPs are the ones who can afford a pricy Owner's Suite, Penthouse, Spa Suite or Villa, all of which allow access to the Haven Courtyard sun deck with pool, whirlpools and comfy sun loungers. If it's food you're after, the Grill offers limited breakfast items and typical grilled lunch items, such as hamburgers, hot dogs and chicken, as well as salad and dessert. 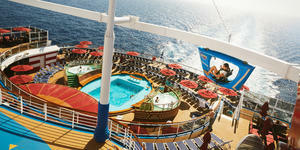 Princess Cruises' Grand and Royal-class ships (i.e., the fleet's largest) are the best for fun in the sun. If you want to be in the heart of the action, stick to the Calypso Reef and Neptune's Reef areas midship. 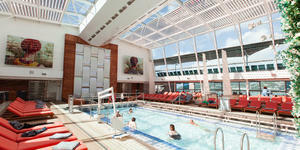 Key components include large pools, hot tubs, bars, silly pool games, musical entertainment and dining options. Plus, many of these ships feature sliding-glass roofs that cover the Calypso Reef pools, useful during inclement weather. 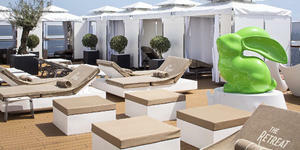 The Sanctuary is an adults-only haven with pampering services and at-your-deck-chair drink and snack delivery. If you want to kick back and relax without paying a premium, there's also the Terrace pool area -- definitely off the big-ship beaten path -- tucked away aft. Plus, spa pools, nestled in the courtyard of each Lotus Spa, offer swim-against-the-current features. When you're feeling peckish, you can have pizza at Neptune's Reef and burgers at Trident Grill. At the Sanctuary, healthful fare, such as tuna pate and smoothies, is available for a small service fee. At night, the Calypso area is transformed into a swim-in cinema with Princess' signature Movies Under the Stars feature. On Regal and Royal Princess, evening brings a fountain show, with water sprays and colored lights choreographed to music at the Fountain Pool. 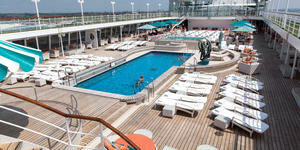 On the outdoor pool decks of Celebrity's Solstice-class ships, kids and grown-ups alike can enjoy splashing through the "dancing" fountains next to the family and sports pools. The adults-only Solarium is a beautiful space, featuring a lap pool, whirlpools, glass walls and roof (with solar panels, to boot) and a water feature that lights up at night. 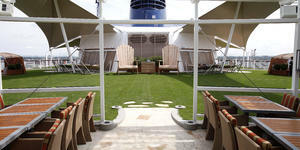 The top-of-ship Lawn Club is carpeted with actual living grass. Passengers can soak up the sun while playing bocce, putting golf balls or picnicking on the grass. Celebrity also offers a glass-blowing studio, open for free demonstrations and extra-fee classes at select times on Eclipse, Equinox and Solstice. On Silhouette and Reflection, the glass-blowing studio has been replaced by an outdoor interactive grill venue, and eight cabana-style alcoves are available for rent. Hammocks and Adirondack chairs have been added to the grassy plot. On all Solstice-class ships, the Mast Grill and Bar serves up favorites like tacos, nachos, hot dogs, brats, burgers, fries and onion rings. Carnival has long been known for its candy-colored, high-energy sun decks -- featuring corkscrew water slides, adults-only havens and casual dining options -- but Carnival Horizon, Carnival Breeze, Carnival Vista and Carnival Sunshine boast the line's best ship-toppers. All four ships offer SportSquare, an outdoor activity hub with attractions like mini-golf, mini-bowling, alfresco billiards and foosball tables. They each also have the SkyCourse, on which harnessed passengers navigate a series of wobbly planks, dangling ropes and other vertigo-inducing challenges. The WaterWorks aqua park features corkscrew slides, a host of water-spraying apparatuses and the Power Drencher, a dump bucket that reverses poles at regular intervals, sending forth a torrent of water on yelping, mock-shocked passengers. 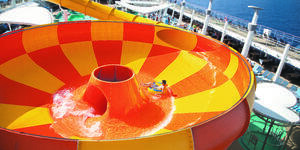 Vista's water park is the largest in the fleet and offers the colorful Kaleid-O-Slide. 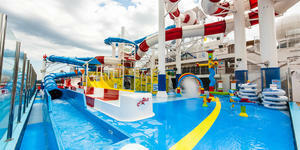 On Horizon, the ship's water park is charmingly Dr. Seuss-themed. The ships also offer the adults-only Serenity, a private enclave with black wicker loungers, clamshells and hammocks topped with teal cushions. On Breeze, it's oddly located by WaterWorks; on Sunshine, it's three decks high. The midship main pool features Carnival's signature Seaside Theater, a giant screen that airs TV episodes, movies and sporting events. Vista and Horizon are the only ships to offer SkyRide, the cruise industry's "first pedal-powered open-air aerial attraction." It's a hanging pod that you pedal around the deck, while suspended in midair. Casual eats rule the pool areas. At the main pool, Guy's Burger Joint, an oft-thronged venue, serves greasy burgers (with all the toppings) designed by Food Network stalwart Guy Fieri. Across from Guy's is the BlueIguana Cantina, which specializes in rolled-to-order burritos and tacos alongside a salsa and hot sauce bar. The stern-situated Tides Pool on Breeze and Vista features Carnival's staple 24-hour pizzeria, serving made-to-order mini-pies. 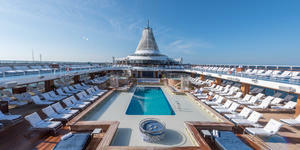 On Eurodam, Koningsdam, Nieuw Amsterdam and Nieuw Statendam, the main midship Lido pools, which can be covered by a retractable magrodome roof in inclement weather, are tastefully decorated in earth tones with brown wicker-like chaises and plush cushions. Each is surrounded by a jumbo whirlpool and a pair of smaller ones. The second Sea View pool is located aft. This adults-only pool features two hot tubs and plenty of deck space with a view of the open sea and the wake. Those looking for a more secluded getaway can rent a cabana at The Retreat. Inside your private tent, you'll find wicker couches and chairs, Evian spray misters, a special menu for lunch service and complimentary snacks like fruit skewers. Dive In, on all ships, serves up burgers, dogs and fries by the Lido Pool. On Eurodam and Nieuw Amsterdam, Slice offers pizza by the Sea View pool, and on Koningsdam and Nieuw Statendam, you can cool down on a hot afternoon with sweet-treat spot Gelato. 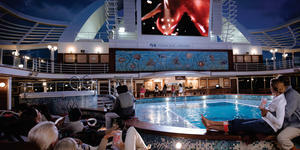 At night, a large movie screen by the main pool on Koningsdam and Nieuw Statendam runs films under the stars. 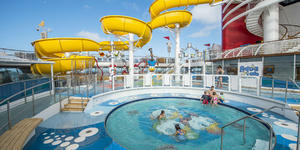 Disney's pool areas on all ships are great for kids, naturally, but also stylish enough for adults. In fact, we love that the three quite distinctive pool areas -- which all occupy the same deck, allowing you to easily walk from one to the other -- are targeted at specific demographics. Mickey's Pool, which boasts a water slide, is for young kids; Goofy's Family Pool (Donald's Pool on Dream), in the center, is for folks of all ages and is the site for major musical entertainment; and the Quiet Cove is for mom and dad -- no kids allowed. During an extensive refurbishment, Disney Magic received the see-through body slide AquaDunk, as well as AquaLab -- a Huey, Dewey and Louie-themed splash area that offers dump buckets, sprayers and a kid-friendly water slide. 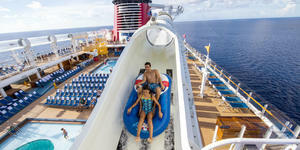 Disney Dream's and Disney Fantasy's pool areas feature the AquaDuck water coaster: a transparent acrylic tube that propels riders along on a raft, up and down four decks of the ship -- at one point swinging out 13 feet over the side and 150 feet above the ocean. Nemo's Reef is a small water park area for the youngest passengers. Disney also utilizes its pool areas for fabulous deck parties, often involving fireworks. 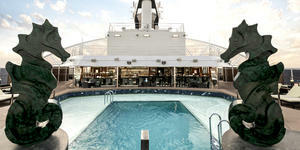 For hungry families, there is plenty of poolside dining, though venues vary by ship. Pinocchio's Pizzeria (by Goofy's Pool), Daisy's De-Lites (sandwiches and salads), Duck-in Diner (Middle Eastern) and Pete's Boiler Bites (for grill fare) are terrific alfresco options. On Dream and Fantasy, Flo's Cafe is an all-in-one pit stop with a grill, pizzeria, salad bar and sandwich spot. And don't forget the Eye Scream self-serve station for frozen goodness. Crystal's cruise ship sun decks exude the same luxurious qualities as the rest of the ships' venues -- spacious upscale decor. 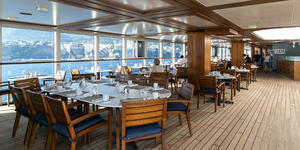 Crystal's all-teak sun decks are furnished with comfortable, padded lounge chairs (not the tacky plastic kind). 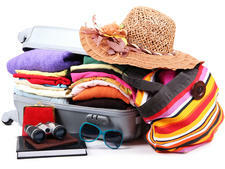 You can use as many fluffy pool towels as you'd like, and the pools and Jacuzzis are relaxing and rarely crowded. Crystal gives a nod to its active passengers with paddle tennis courts, shuffleboard, golf driving nets, a putting green and Ping-Pong tables. Outdoor exercise equipment is stationed along several of the ships' aft decks. Crystal's poolside food venues are some of the best around. The Trident Bar and Grill offers typical grill fare like burgers, as well as more unusual specialty sandwiches. 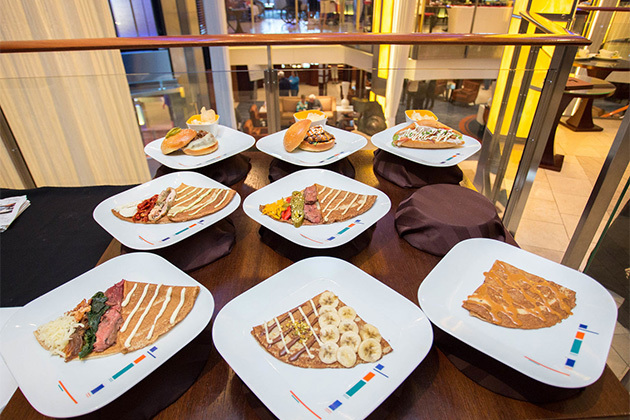 Tastes features themed buffets and a casual dining option under the stars. MSC Seaside is all about outdoor time, and its sun deck spaces aren't limited to the highest decks. The main Miami Beach Pool, a zero-entry pool; family-friendly Jungle Pool, with its retractable roof; and Yacht Club Pool, for Yacht Club cabin guests only, are up top, but the adults-only South Beach Pool is down on Deck 7 aft. If you're not afraid of heights, stroll along the glass Bridge of Sighs platform and you can gaze down from the main pool deck to the ocean and the South Beach Pool below. For a bit of sun-deck adrenaline, Seaside offers the Forest AquaVenture water park, encompassing four water slides (including one with colored lights) and a wading pool with fountains, water sprayers and a dump bucket. 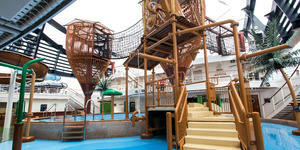 There's also a giant climbing structure and two extra-fee ziplines. 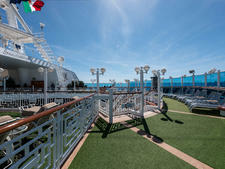 Food is only steps away, no matter which sun deck area you choose. 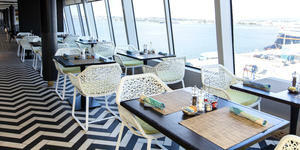 Up top by the Miami Beach Pool, the Biscayne Bay buffet serves lunch and keeps its pizzeria and grill going between meals. Down by the South Beach Pool, the Venchi Gelateria and Creperie beckons with waffles and crepes, and the Yacht Club Pool has its own grill and juice and ice cream bar. At night, the Miami Beach Pool area offers outdoor movies; the pool itself transforms into a stage for concerts and other entertainment. The sun decks on Oceania's ships are centered on tranquil saltwater pools, each ringed by comfortable, cushion-topped loungers and straddled by a pair of whirlpools. Gorgeous outdoor living areas -- boasting plush couches, deep armchairs and people-watching views -- are tucked away behind the pools, and they're perfect for folks who prefer to sit in the shade. 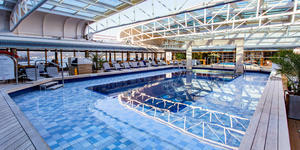 The Spa Terrace -- a fantastic and otherwise hidden sun deck with a huge whirlpool -- is available for free to all passengers who receive spa treatments, as well as those booked in Concierge cabins and higher. 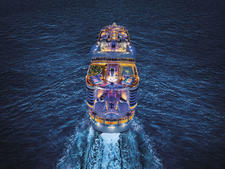 It's available to all other cruisers for a fee, based on the number of days of access. It's located just beyond the spa at the bow of the ship. Table tennis, shuffleboard, beanbag toss and golf putting greens are scattered around the top decks for leisurely sea day pursuits. The poolside Waves Grill offers sandwich fare -- creative burgers and paninis, whose recipes came from Oceania's staff -- and waiter service. Milkshakes served from a dedicated station are refreshing on hot days.